First of all, Joy’s Teaspoon Sun Kissed Jasmine blend is a little bit like drinking liquid sunshine! The tea is complex combination of green teas (China sencha, Lung Ching, green Yunnan), white teas (Pai Mu Tan), and flavorings (rose buds, rose petals, mallow blossoms) that all together create a blend that packs an explosively floral and tropical punch. I’m usually not a fan of fruity scented teas, but once steeped I found this particular blend to be a smooth and well-balanced. The mild, sweet flavor of the white and green tea provides a great foil to show off the depth in the sweet tropical fruit combination, evocative of sun-drenched pineapple and juicy papaya. 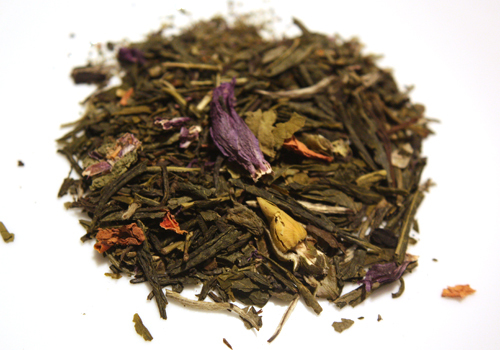 Deep green, big silvery brown and fluffy white tipped tea leaves are accompanied by rose buds and petals to create a soft green and white tea blend. The aromatic bouquet includes exotic fruits with fresh citrus nuances and a hint of delicate jasmine rounds out what promises to be a very special pleasure! Steep at 176-194 for 2-3 minutes. Use 1 teaspoon of tea for each 6 oz. serving. When brewing the same leaves for a second, third or even fourth time, increase the steep time by 1-2 minutes. For this tasting, I steeped at 180F for 2 minutes. The loose leaves of the dry tea are composed of large fragments of tea leaves ranging from deep green of pine needles to the pale olive of newly budded spring growth, nestled amidst small yellow blossoms and a fine, soft bed of smaller leaf particles. It is deeply fragrant and most certainly doesn’t smell of jasmine, but instead a blend of orange citrus and tropical fresh fruit, sugary and sweet. The liquor from the tea is a bright citrine gold, very appropriate to the sun-kissed jasmine name. 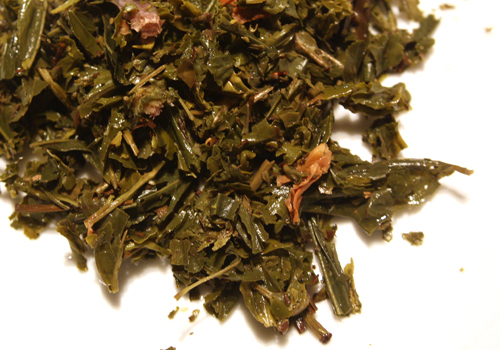 The steeped tea leaves are a slightly deeper color of the dry leaves. Rehydrated, the leaves reveal themselves to be large leaf fragments interspersed with the occasional twiggy stem. Some of the leaves show russet edges, a hint of oxidation. The aroma of the steeped leaves is strongly floral. The first infusion of this tea has a much milder taste than the fragrance promised by the dry leaves. I’m not usually a fan of strongly scented teas, so this was a good thing to me. The green and white teas provide a smooth and mellow base to the tea, creating a full body to the liquor and a natural sweetness. The flavoring of the tea shows itself as a citrusy aroma and a fruity twist to the body. It is very refreshing and summery, well blended to go together without any jarring dissonance to the taste. The aftertaste is dry with a little bit of a pucker. 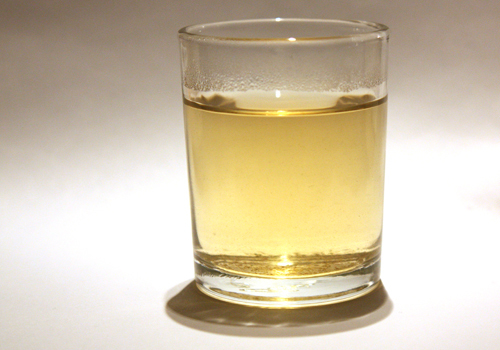 With the second infusion, the scenting has dissipated into only a mild aftertaste. It’s still a very flavorful and strong green and white tea. Overall this is a nice blend that marries green and white into a naturally sweet and smooth blend with the fragrance and fruity taste of fresh blossom. It is a mild way to start your day, or a wonderful way to relax after a hard day’s work. This tea can be purchased on the Joy’s Teaspoon website here.